Of all of Morton Feldman's later works, the epic string quartets, the piano and orchestra compositions, and his works for cello and piano, none of them is as puzzling as this untitled work from 1981. As Feldman gradually adapted to the idea that he could control even silence with his complex rhythmic figures, his works began to transcend the idea of scale. His works became large tranquil oceans whose silences were interrupted casually by near transparent, barely present waves of sound played barely above the threshold of silence. For whatever reason (since there are no additional compositional notes to go by), this work moves against Feldman's obsession with silence. This work is to be played at low volume, but the silences here get used sparingly. Indeed, compared to Feldman's other scores, "Untitled" seems to be written with the notion of "tempo" in mind -- a concept he had sought to abandon almost 20 years earlier. The deep percussive chord voices of the piano against the minimal timbral resonances of the cello are a true contrast for Feldman. His augmented and diminished chord structures are actually tonal clusters played quickly to create a polytonality for the cello to express its voice against. These are oppositional figures, playing nearly two completely different scores! Over nine movements (the fourth through sixth are the places of tonal and timbral intersection and the notion of tempo begins to recede a bit before being brought back in the seventh), cellist René Berman and pianist Kees Wieringa hold the composer's dictates taught, keeping the considerable tension wound tightly within the score until it becomes literally unbearable -- a notion that is completely alien to all of Feldman's music. There is no slackening of the reins, and hence the dynamic range is wider and the drama is fierce. For those who thought they knew everything Feldman had to say, "Untitled" is truly one of his masterworks, a composition of compressed energy, elongated tensions, percussive excess, and lush textures. The sound is warm and full; the set was recorded hot to insure full fidelity at low volume. 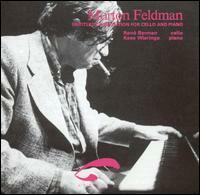 Morton Feldman was a unique and influential American composer. His experimentation with non-traditional notation, improvisation, and timbre led to a characteristic style that emphasized isolated and usually quiet points or moments of sound. His work with John Cage and his association with the avant-garde of American painters, including Pollock, Rauschenberg, and Rothko helped him to discard traditional music aesthetics for a less ordered and more intuitive, "moment form" approach to structure. His earlier work of the 1950s utilized graphic notation in which only approximate indications were given to the performers. This eventually proved unsatisfactory to Feldman because it allowed for non-idiomatic, uncontrolled improvisation. Throughout the decade, he experimented with different versions of notation that gave varying amounts of freedom to the performers. The first experiment was to abolish rhythmic notation altogether. The pitches were specified exactly with open note heads, but all other elements were left entirely up to the performers. The second experiment involved giving an identical written part to several players with the intention of producing "a series of reverberations from an identical sound source." A work that is indicative of this reverberation technique is the Piece for 4 Pianos (1957). Feldman's third innovation of this period was a variation on the first one. Once again, note durations were left up to the performers, but in this case, all other elements were notated precisely. In his Prince of Denmark (1964), for solo percussion, the graphic notation is a key that assists the performer in making their own version of the piece. By 1970, using conventional notation, his distinctive doctrine of quietness, stillness and lack of dramatic rhetoric was fully in place. Feldman's best-known chamber works of this period include The Viola in My Life (1970-1971), Rothko Chapel (1971), and Why Patterns (1978). In his last compositions, Feldman became interested in the use of time and proportion. The resulting pieces became greatly expanded in scale, at least nine lasting more than ninety minutes. His composition For Philip Guston lasts four hours, and his String Quartet II can take up to six hours to perform. Yet even in his last works, Feldman's method is apparently intuitive, as he never admitted to, nor has any theorist been able to uncover, any systematic means of pitch selection.